This picture was sent in by SF. 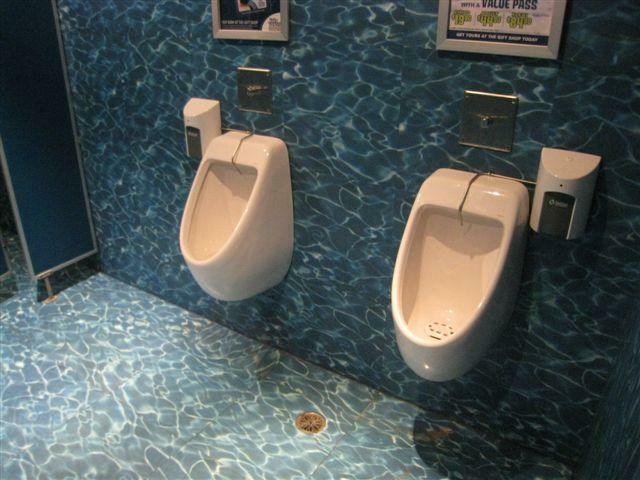 He writes: "This men's room has an aquatic theme consistent with the underwater aquarium décor." From Wikipedia: "Kelly Tarlton's Underwater World is a public aquarium in Auckland, New Zealand that was opened in 1985. It was the brainchild of New Zealand marine archeologist and diver Kelly Tarlton (1937-1985). Built in disused sewage storage tanks, the aquarium used a new form of acrylic shaping, which allowed curved tunnels rather than viewing areas with flat panels only, as in previous aquariums. The project is also one of the first to use conveyor belts to slowly move people through the viewing areas"